The presumed mother is J-16. She is a 43-year-old that has had three surviving calves, Balcomb said. The baby killer whale appeared healthy. It has been designated J-50. Brad Hanson is a wildlife biologist with NOAA Fisheries. He said he had noticed that satellite tracking showed the whale pod to have ducked into a narrow, protected passage. It's between Shaw and Orcas islands in the San Juan archipelago. It's an area where he'd never seen them travel before. Killer whales are 7 to 8 feet in length at birth. They weigh about 400 pounds. They are born after a 17-month gestation, Balcomb wrote on the Center for Whale Research website. It takes until their early teens for females to mature and late teens for males to mature. It is good news that J-16, the mother, is a proven producer of calves. Unfortunately, her next most recent calf (J-48) was born and died in December 2011 in Puget Sound, Balcomb wrote. Following the death of an adult orca, a baby orca of the same endangered group is a good sign. They live in pods that include their family and complex relatives. The baby whale was found by scientists in British columbia. The death of a pregnant orca was distressing for scientists. This was because it has been many years since the successful birth of another orca. I think it's great that orcas are becoming more dense in population. I don't want them to become extinct. I think the newborn calf is a good sign for the J-pod and the people that are monitoring the J-pod. It is sad to see that 35-45% of newborn calves die within a year. I wonder why the killer whales are endangered. I think it is because of people catching too many chinook salmon from the oceans which limits the number of chinook salmon there are for the killer whales to eat. The killer whale calves must survive. I think there should be a program which works to breed the killer whales in captivity. J-50 a newborn killer whale, brings hope, after a pregnant killer whale, that belonged in the same pod, died not so long ago. It's mother, J-16, had two other surviving calves, but unfortunately her most recent calf died in 2011. Killer whales are endangered, which is why everyone hopes that J-50 survives. I also hope that J-50 survives and I learned from this article that 35 to 40% of Killer Whales die in their first year, which I think is very sad. This article is about a newborn Killer Whale also known as an Orca Whale and how they discovered the newborn Orca. These whales are put into certain groups as they are an endangered species and are to be protected. The mother of the newborn whale is a 43-year-old in the category J-16 and the baby is a J-50. These are the designated groups that help to protect the Orca's and keep track of their population. 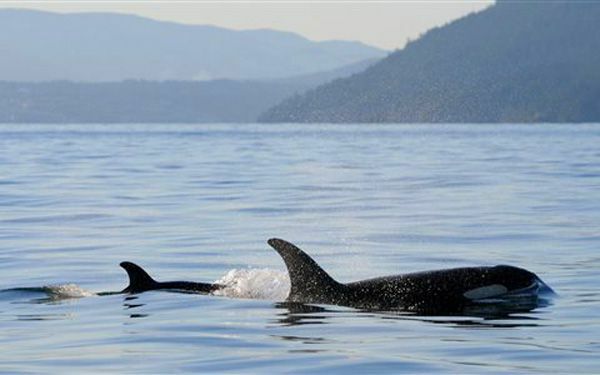 The researchers also studied where the Killer Whales had traveled. This article was interesting to me because I had not heard about the endangerment of the Killer Whales. I enjoyed reading that the mother had lived for so long and had 3 surviving calves. i think this is just great and very good that these Orcas are still reproducing. these animals might be endangered so its is fantastic that they are having baby Orcas. and it is so sad that a 19 year old whale was found dead while she was pregnant. that is horrible because that is 2 out of not many very Orcas remaining. This is great news to me! Orcas are one of my favorite animals so it is awesome to here that this endangered species are having new babies. I wish I could go to the site of this of this Orca pod and meet them face to face. "Save the Orcas!" Baby orcas are very large when they are born. They weigh about 400 pounds and are 7-8 feet in length. It is also very rare for an orca baby to live. It had been two and 1/2 years since an orca baby survived. Killer whales are some of the sickest creatures on earth. I didn't know the actual name was orcas. This is a good thing for a old whale be in great shape . 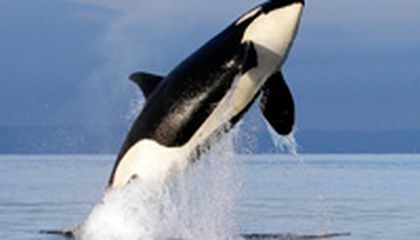 I think that it is good to have some new orcas in the world because they are endangered. I hope that the whales can be the animals of the future. I think that these whales need to be somewhere safe so that they can multiply and then have more than 500 whales. I think that having these whales being in a space where they can die is just wrong. I think that they should keep them in like a ocean, not like a lake somehwere. I hope that these people whouldn't care about these animals. It is part of nature and that is how god wants it.